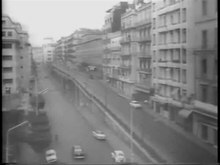 Barricades in Algiers, January 1960. The banner reads, "Long live Massu" ( Vive Massu). 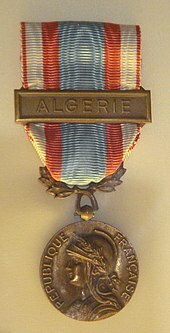 The generals' putsch in April 1961, aimed at canceling the government's negotiations with the FLN, marked the turning point in the official attitude toward the Algerian war. Leading the coup attempt to depose de Gaulle were General Raoul Salan, General André Zeller, General Maurice Challe, and General Edmond Jouhaud. :87–97 Only the paratroop divisions and the Foreign Legion joined the coup, while the Air Force, Navy and most of the Army stayed loyal to General de Gaulle, but at one moment de Gaulle went on French television to ask for public support with the normally lofty de Gaulle saying "Frenchmen, Frenchwomen, help me!". :89 De Gaulle was now prepared to abandon the pieds-noirs, which no previous French government was willing to do. 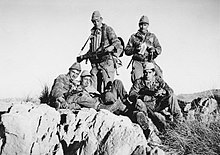 The army had been discredited by the putsch and kept a low profile politically throughout the rest of France's involvement with Algeria. The OAS was to be the main standard bearer for the pieds-noirs for the rest of the war. 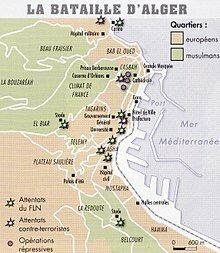 Talks with the FLN reopened at Évian in May 1961; after several false starts, the French government decreed that a ceasefire would take effect on March 18, 1962. 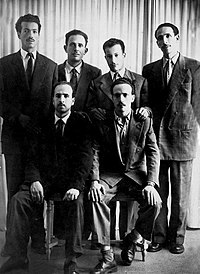 A major difficulty at the talks was de Gaulle's decision to grant independence only to the coastal regions of Algeria, where the bulk of the population lived, while hanging onto the Sahara, which happened to be rich in oil and gas, while the FLN claimed all of Algeria. During the talks, the pied-noir and Muslim communities engaged in a low level civil war with bombings, shootings, throat-cutting and assassinations being the preferred methods. :90 The Canadian historian John Cairns wrote at times it seemed like both communities were "going berserk" as everyday "murder was indiscriminate". :90 On 29 June 1961, de Gaulle announced on TV that fighting was "virtually finished" and afterwards there was no major fighting between the French Army and the FLN; during the summer of 1961 the OAS and the FLN engaged in a civil war, in which the greater number of the Muslims soon made a difference. :90 To pressure de Gaulle to abandon his demand to keep the Sahara, the FLN organized demonstrations in France from Algerians living there in the fall of 1961, which the French police crushed. :91 It was in the course of crushing one demonstration that a massacre of Algerians on 17 October 1961, which was ordered by Maurice Papon, took place. 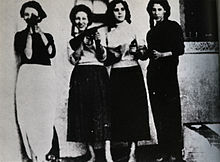 On 10 January 1962, the FLN started a "general offensive" against the OAS, staging a series on the pied-noir communities as a way of applying pressure. :91 On 7 February 1962, the OAS attempted to assassinate the Culture Minister André Malraux by setting off a bomb in his apartment building that failed to kill its intended target, but did leave a four-year girl living in the adjoining apartment blinded by the shrapnel. 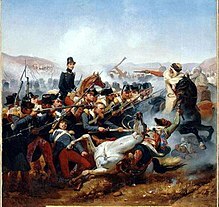 The blinding of the girl did much to turn French opinion against the OAS. ^ Encyclopedia of Violence, Peace and Conflict: Po - Z, index. 3, Academic Press, 1999 ( ISBN 9780122270109, lire en ligne [archive]), p. 86. ^ Crandall, R., America's Dirty Wars: Irregular Warfare from 1776 to the War on Terror, Cambridge University Press, 2014 ( ISBN 9781139915823, lire en ligne [archive]), p. 184. This page is based on the Wikipedia article Algerian War; it is used under the Creative Commons Attribution-ShareAlike 3.0 Unported License (CC-BY-SA). You may redistribute it, verbatim or modified, providing that you comply with the terms of the CC-BY-SA.